Eden Hazard lone goal was the difference as Chelsea edge past Bournemouth during their Carabao Cup quarter final clash at Stamford bridge yesterday. 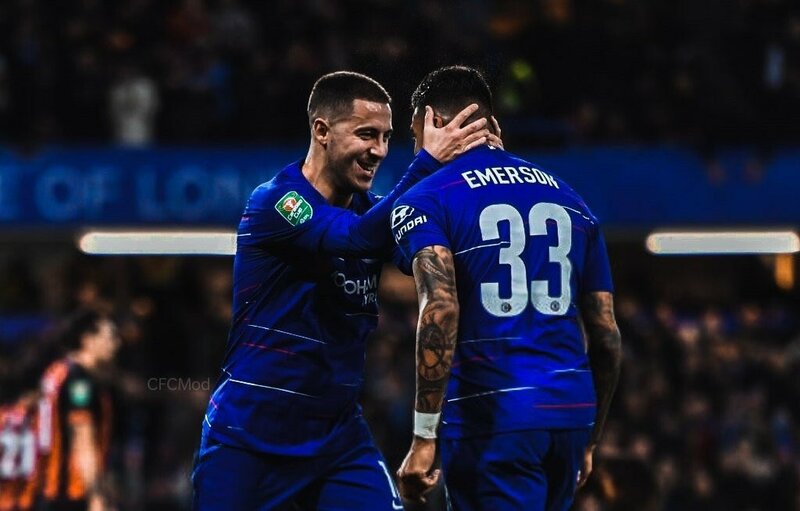 With the goal yesterday, the Belgian has now been directly involved in 19 goals (9 assists) and (10 goals)in his last 20 appearances for Chelsea in all competitions. Amazing isn’t it??? The Belgian International was simply unplayable for the visitors as he kept on tormenting their defence line with his marauding runs and trickery on the ball until he opened the scoring in the 83rd minute. His display during the tie has gotten fans reacting on social media with some tagging him as ‘Chelsea’s saviour’. Knocking Teams out of the Carabao Cup on your own? I remember the ton of Chelsea tweets on Twitter calling for Eden Hazard to be sold, that he should play for the badge and not the manager. That he is a disgrace to the club. Pretty similar to all the things being said about Pogba today. I’m starting to think I genuinely do not love another human being as much as Eden Hazard. The post âIâm Starting To Think I Genuinely Do Not Love Another Human Being As Much As Eden Hazard.â â Fans Laud The Belgian For Taking Chelsea To Carabao Cup Semi Finals .